since we had leftover turkey from my mom and leftovers of the stuffing that we made on sunday, we thought that there was nothing better to do than to make tanksgiving leftover sandwiches! we found a lovely loaf of sourdough bread at the grocery store. 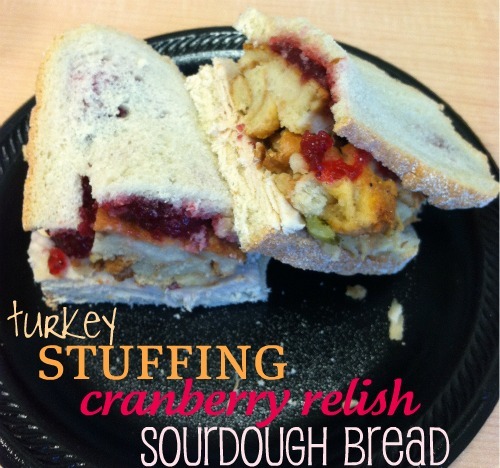 we sliced it, spread cranberry relish on it, and we piled it high with turkey and stuffing . . . heavenly. yes, it's basically bread between two slices of bread. but there's turkey and cranberry relish in there too, so that balances it out . . . right? yes, it's messy. get a napkin, or better yet, get a bib if you plan on making this sandwich. oh, and one more thing: let me tell you from first-hand experience that it is downright dangerous to eat this sandwich at work. it will make you want to crawl under your desk and hibernate for the rest of the afternoon! Thanks doll for the compliment. I am glad that you and Ryan enjoyed the leftover turkey. Last night I made for dad and I turkey pot pie with homemade crust. (Not that I would use package crust). There is still turkey left because that was a 22 pound bird. could you ask your mom to come cook me a whole turkey? i love the sandwiches the most!